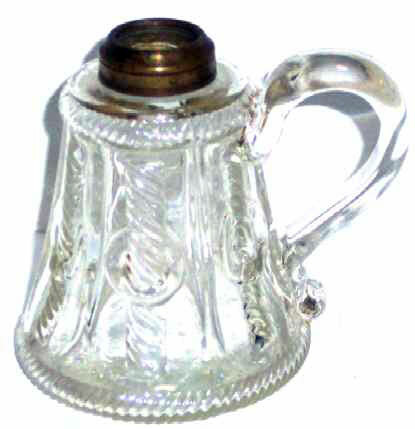 This lead crystal, 3 part mold blown finger lamp with applied handle was made by the Boston and Sandwich Glass Company c. 1845-65. There are six lengths of cable around the font each running through a ring, thus the name. The handle was applied between two panels so the pattern is not distorted. The lamp is in exceptional condition. It is 3-7/8" high and 3-1/2" diameter at the base.